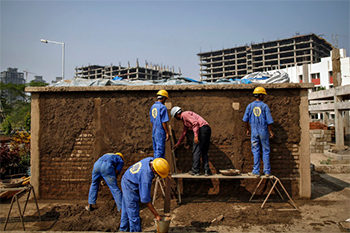 China’s vocational training 16 times India’s: Can budget push help? About 10.6 million Indians are unemployed, according to a 2011-12 survey by the National Sample Survey Office; of these, 7.8 million are in the age group of 20-59 years. Similarly, an estimated 474 million people have part-time employment. There is a shortage of 100,000 trainers to implement skill-development programmes across the country, according to data provided to the Lok Sabha (lower house of Parliament) on Februrary 24, 2016, five days ahead of the budget. 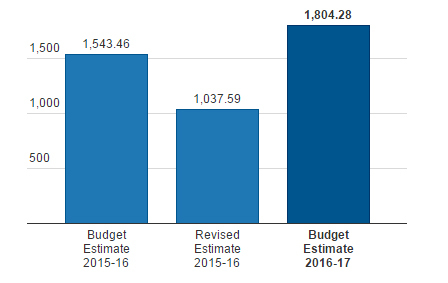 The question is: Can the 74% increase in Budget 2016 allocation for skill development and entrepreneurship–from Rs 1,038 crore ($160 million) for last year to Rs 1,804 crore ($264 million) in 2016-17–address India’s great job shortage? In the information technology sector, 1.4 million sought jobs in 2015, of which 209,000, or 17%, found jobs, as IndiaSpend reported earlier. Similarly, in the banking sector, net hiring, by government and private banks, was reported to be 33,224 in 2015. Only 2% (nearly 9 million) of Indian workers are formally skilled; net enrolment in vocational courses in India is only about 5.5 million per year, compared with 90 million in China and 11.3 million in the United States, as IndiaSpend reported previously. India needs 23 million jobs annually, but over the last 30 years, the country has created only about seven million jobs every year, as IndiaSpend reported recently. Finance Minister Arun Jaitley, while presenting his third budget on February 29, announced plans to establish 1,500 multi-skill training institutes across India with Rs 1,700 crore ($200 million) set aside in Budget 2016. 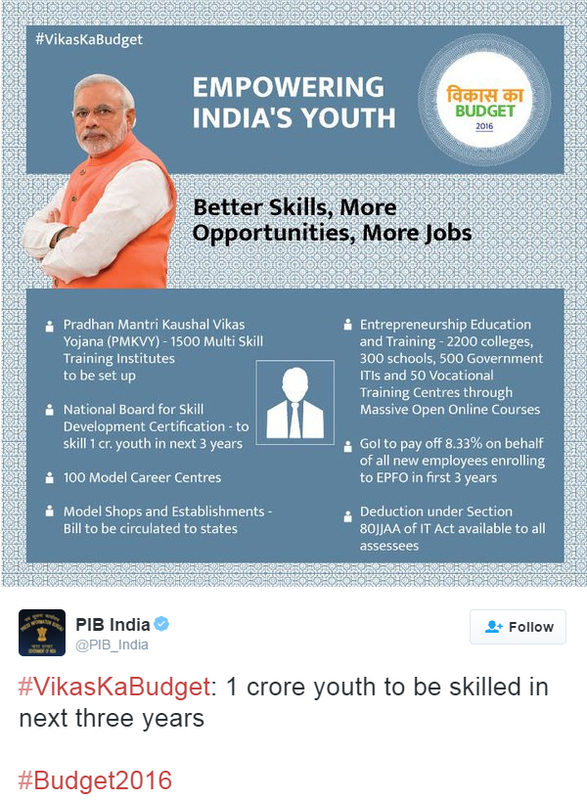 In addition to setting up the National Board for Skill Development Certification in partnership with the industry and academia, the government is also planning to skill 10 million youth over the next three years under the Pradhan Mantri Kaushal Vikas Yojana (PMKVY), Prime Minister’s Skill Development Scheme. The creation of a separate ministry for skill development and entrepreneurship was announced last year in this direction. The major allocation has been to PMKVY, Rs 1,771 crore, under which the National Skill Development Fund/Corporation (NSDC)–tasked with raising funds from both government and non-government sectors for skill development–received the most, Rs 1,350 crore. The PMKVY, launched on July 15, 2015, is a skill certification and reward scheme, and is likely to benefit 2.4 million people. In the first six months of the current financial year, NSDC achieved less than 15% of its 3.7 million skill-training target. Besides, against a target of 2.4 million under PMKVY, NSDC had achieved less than 30% in terms of training and 10% in terms of certification, as of February 2016, according to this Mint report. Nearly 19 million people have been trained under 40 different skill-development schemes over the last three years, according to data tabled in the Lok Sabha. As many as 5.5 million people are currently enrolled in skilling courses, with 231 million Indians aged 15-24 needing to be skilled, IndiaSpend reported recently. Employment opportunities in India are set to grow from 461.1 million in 2013 to 581.9 million in 2022, across 24 sectors. 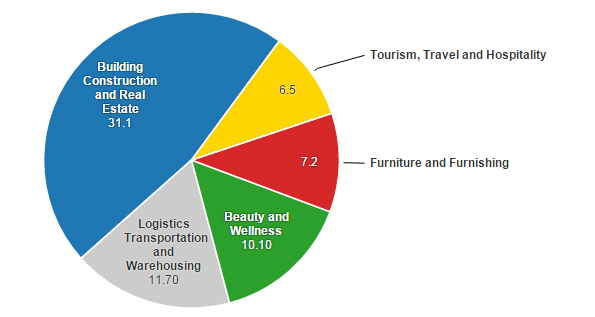 The additional demand in many sectors, such as construction, retail and wellness, is predicted to be 109.7 million by 2022, with the top 10 sectors accounting for 80% of jobs needed, according to an NSDC study. Building construction and real estate sector will need 31.1 million people, followed by logistics, transportation and warehousing (11.7 million) and beauty and wellness (10.1 million). Maharashtra tops the list with 15.5 million more people needed, followed by Tamil Nadu (13.6 million) and Uttar Pradesh (11 million). The government has proposed setting up 100 “model career centres” by the end of 2016-17 under the National Career Service, an online portal that matches job-seekers with jobs. 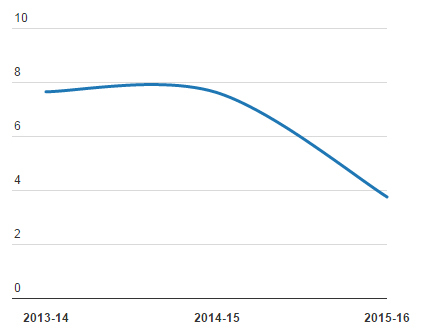 About 35 million job-seekers have registered since the launch of this portal in July 2015.